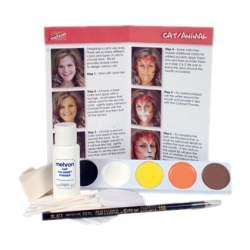 The Cat/Animal kit is perfect for schools and theatres who are performing the show "Cats". The kit includes all the makeup, applicators, removers, and even whiskers to create a complete cat makeup. This kit can also be used create a cat or animal Halloween costume. The kit includes step-by-step instructions, 5-color makeup palette, makeup remover cloth, full size pencil liner, setting powder, full size makeup brush, non-latex foam wedge, powder puff, and whiskers. Each kit provides enough makeup for 4 – 6 full face applications.